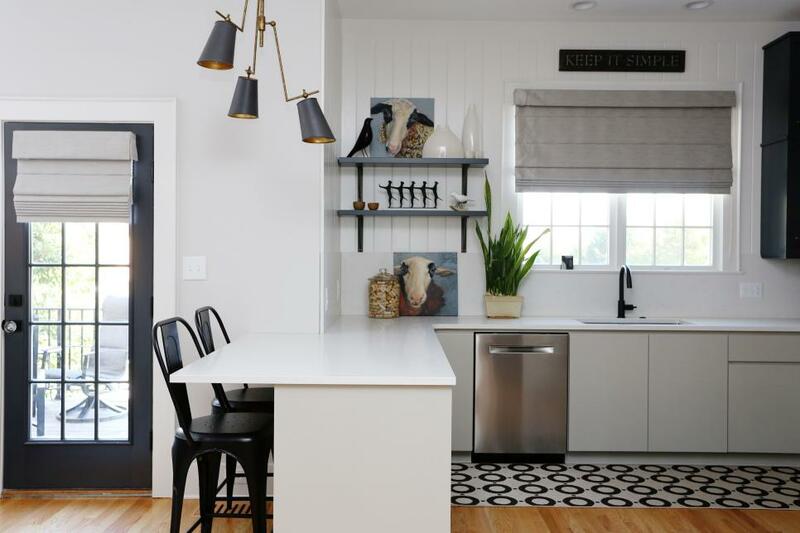 The homeowner wanted a modern bistro-inspired kitchen, which was achieved by thoughtful details, such as the subway tile inside the back of the upper cabinets. 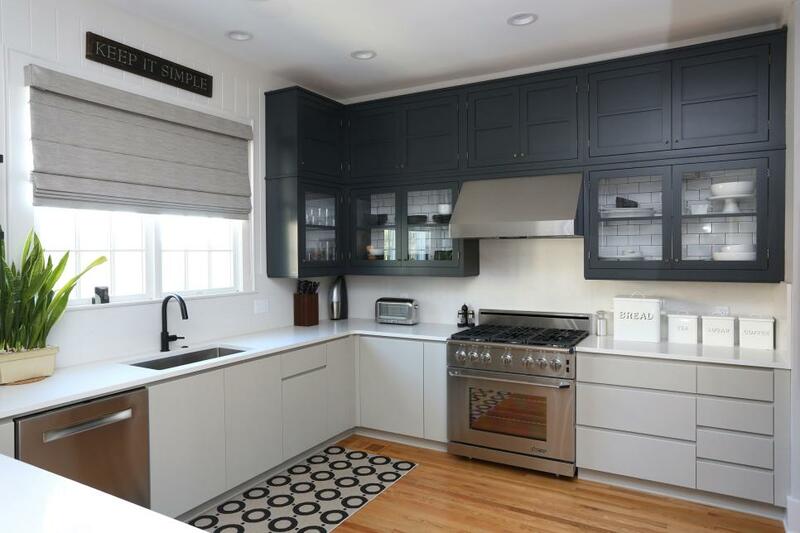 The two-toned cabinetry creates a striking contrast, while hardwood floors add warmth to the space. Built-in stainless steel appliances add to the contemporary feel of the space. The angled design of the counter in this open kitchen enhances the space's modern look, from Eisner Design. 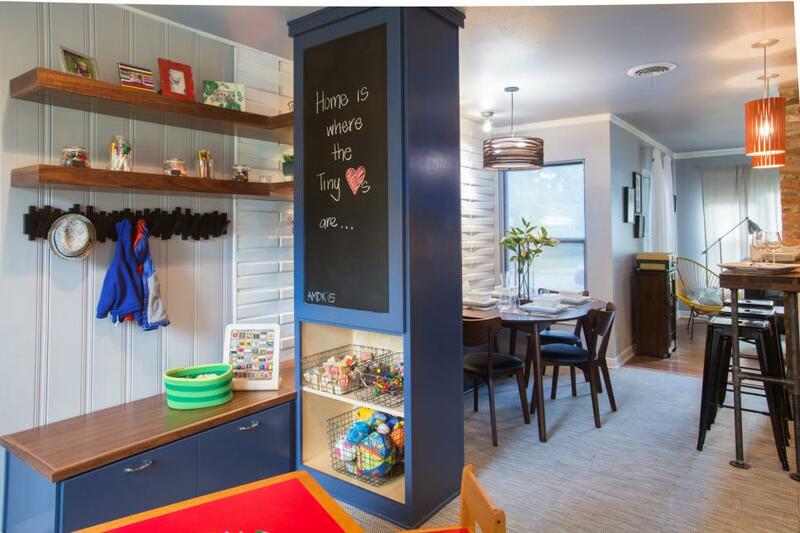 In this kitchen makeover from HGTV's America's Most Desperate Kitchens, the back side of the a storage cupboard, which faces on a new kids' play area, is painted with kid-friendly chalkboard paint. 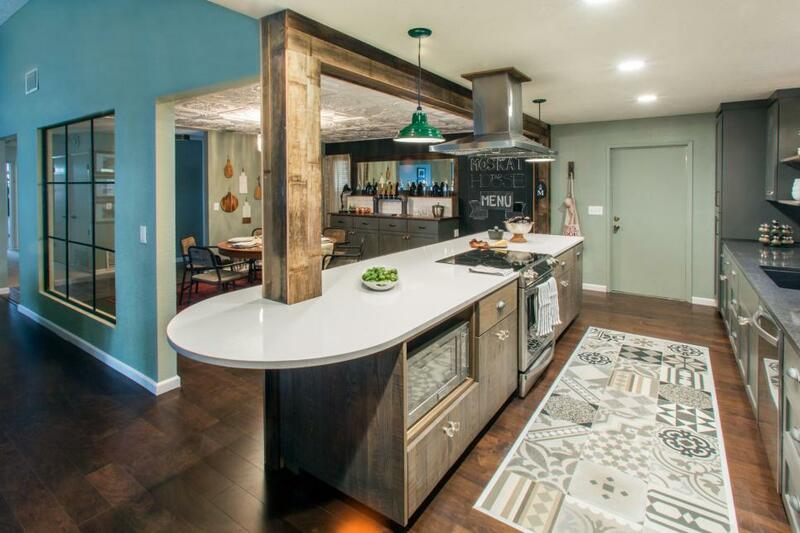 Contemporary meets industrial in this loft kitchen. 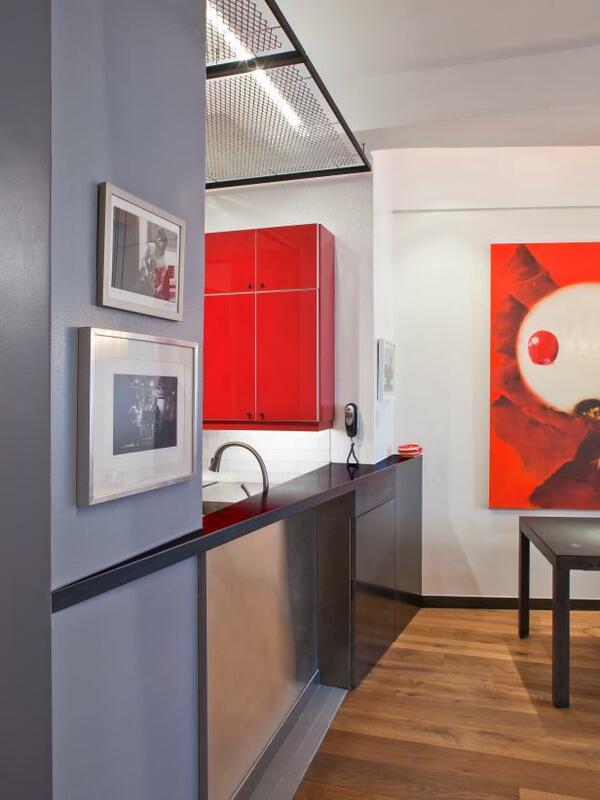 The exposed ductwork actually acts as a space divider, a perfect example of form marrying with function. 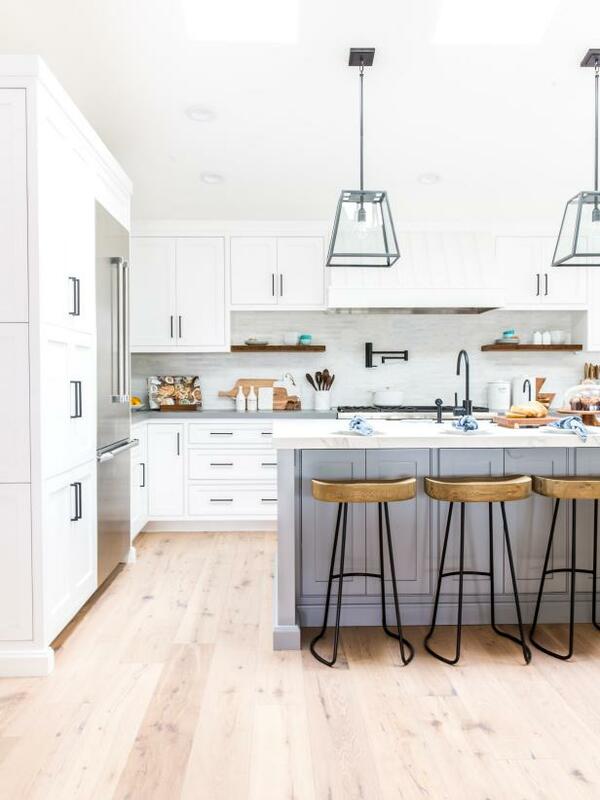 The dark wood cabinets go well with the room's other woods and neutral tones, while the white tile backsplash works to keep the room light and bright. 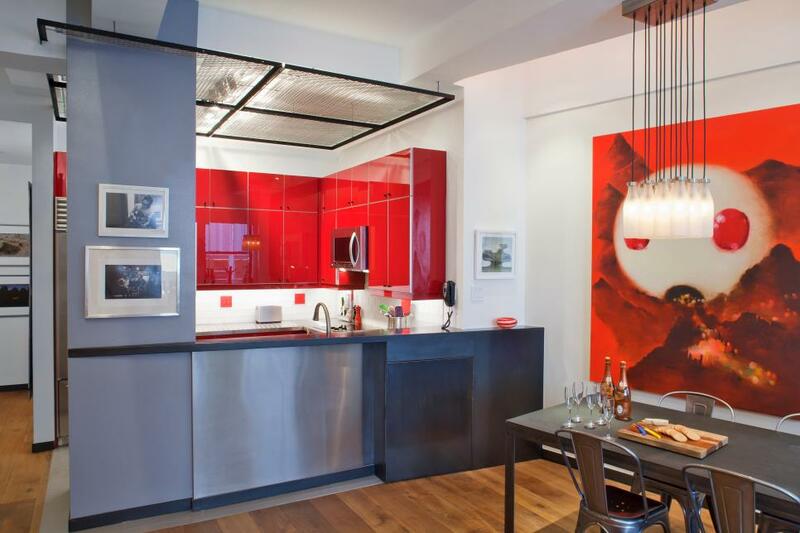 Red barstools at the kitchen island provide the kitchen's lovely pop of color. 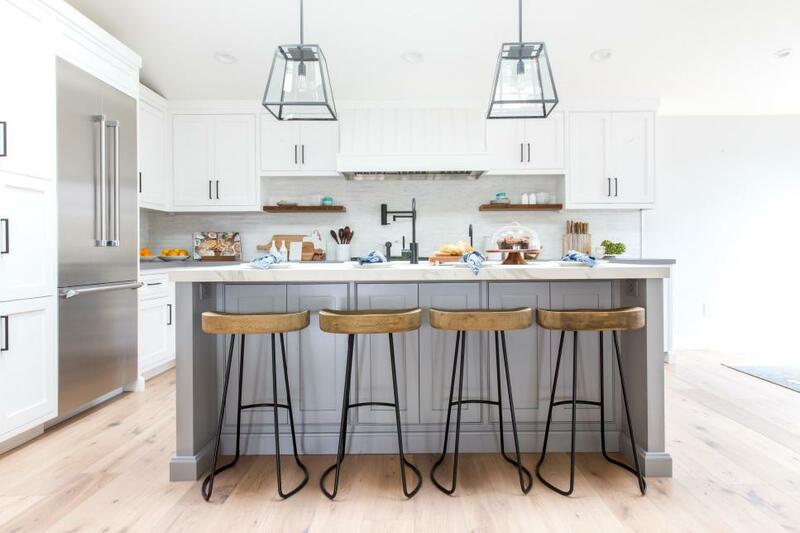 To expand the seating options in this kitchen, designers from America's Most Desperate Kitchens created a small, casual table that connects to the larger, more formal one. This gives the homeowners the option of using the smaller table when they are home alone and simply want a casual meal or expanding their entertaining space, using both the larger table and the smaller table concurrently. 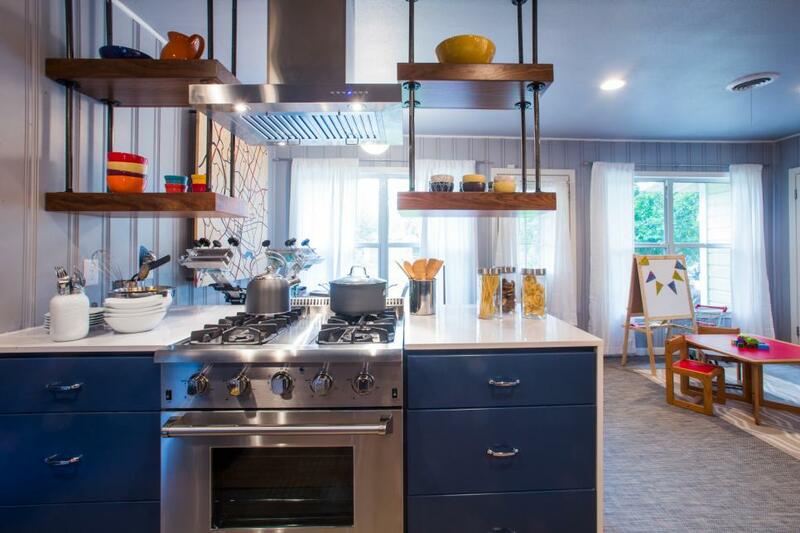 To create shelving that fit the style of the kitchen, designers of America's Most Desperate Kitchens added some wood shelves suspended by metal bars to create industrial style shelves above the stove in this bright kitchen space. 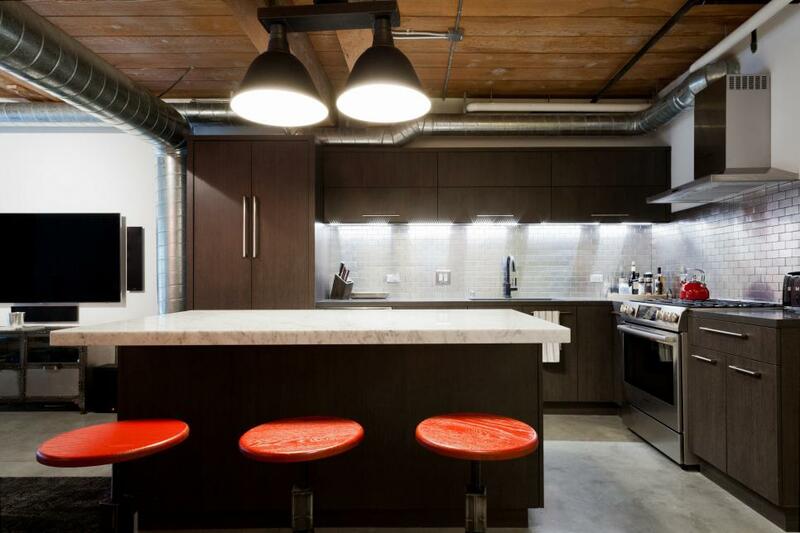 Housed in a former printing factory, this apartment maintains some of its industrial look, including blackened steel bar counter stainless steel appliances, and a steel mesh dropped ceiling. 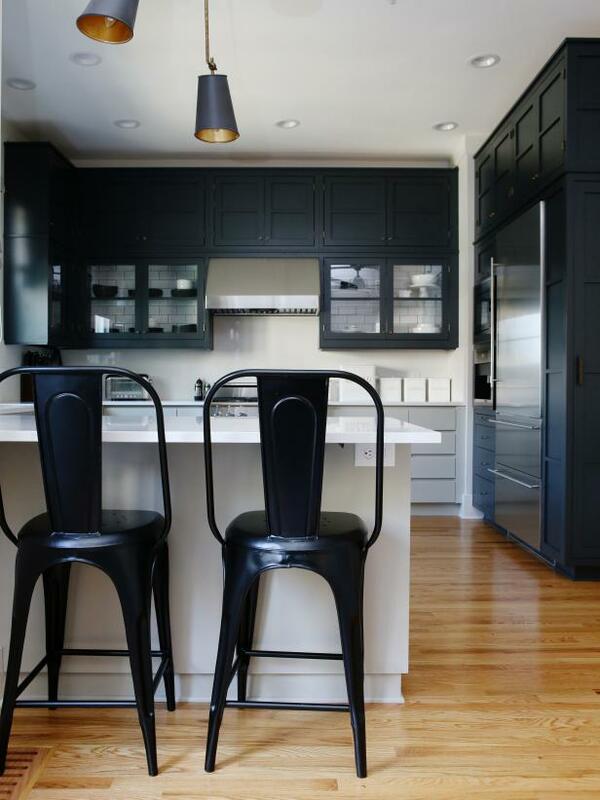 Black industrial barstools pull up to clean Caesarstone countertops for a casual dining spot in this spacious kitchen. Hardwood floors add warmth to the space, while a sleek light fixture brings a contemporary vibe to the room. 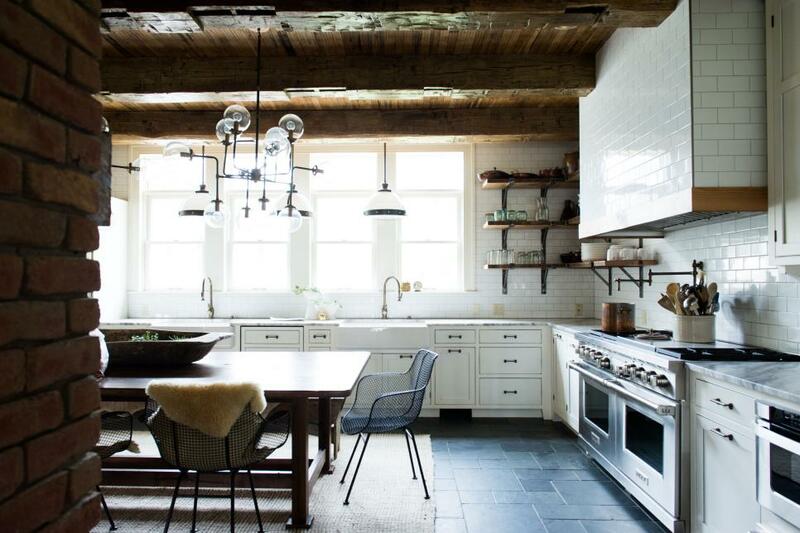 This industrial farmhouse kitchen boasts unique elements from each style that add to the design, while the clean lines and neutral colors of the space bring a modern feel to the kitchen, creating a space that is unique to the homeowners. 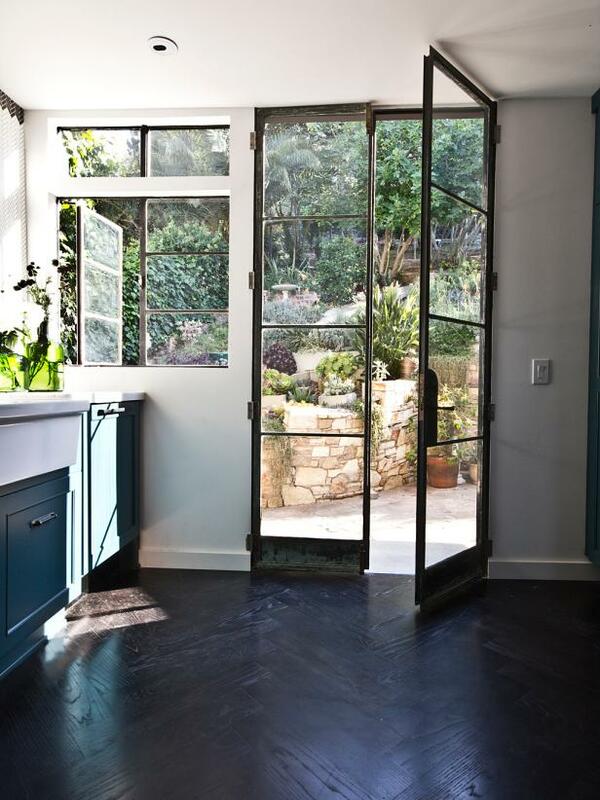 The salvaged industrial metal doors and windows gave the new space the perfect nod to the home's original Tudor architecture. 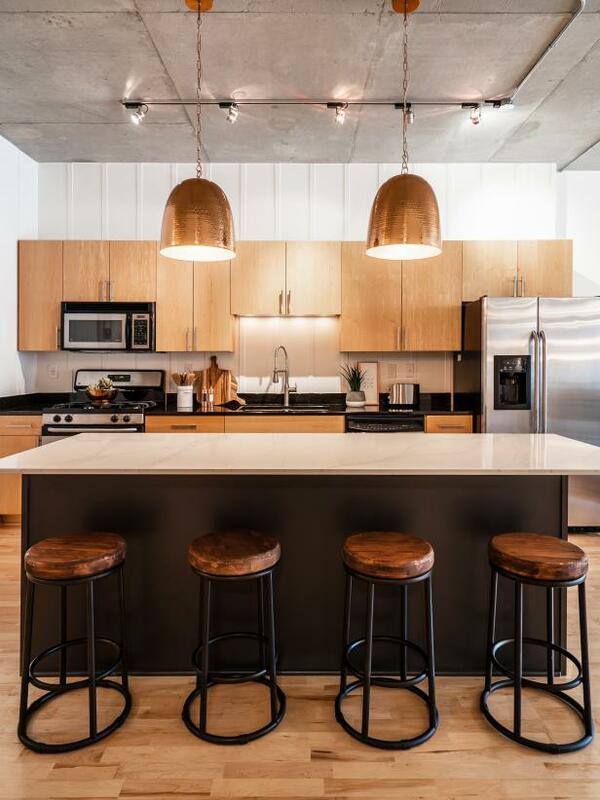 Light maple cabinets and vertical batten board used for the backsplash add contemporary style to this urban loft kitchen. 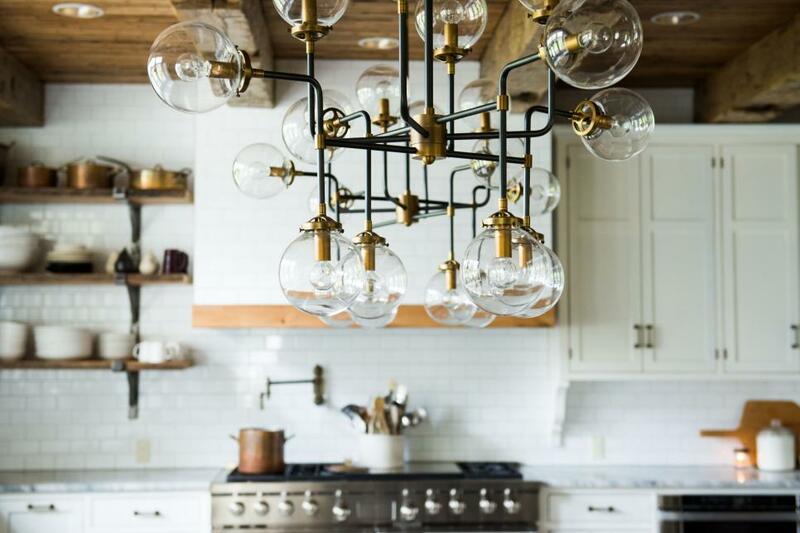 Industrial touches, including copper pendant lights and wood-and-metal barstools, add welcome contrast and texture to the neutral space. The kitchen was gutted with the goal of creating the essence of a modern bistro-inspired space. Two-toned, custom inset cabinetry and a clean Caesar-Stone countertop pair for a sleek look. A tongue-and-groove wood feature wall behind the kitchen sink adds a cottage touch to the space, while industrial barstools pull up for casual dining. 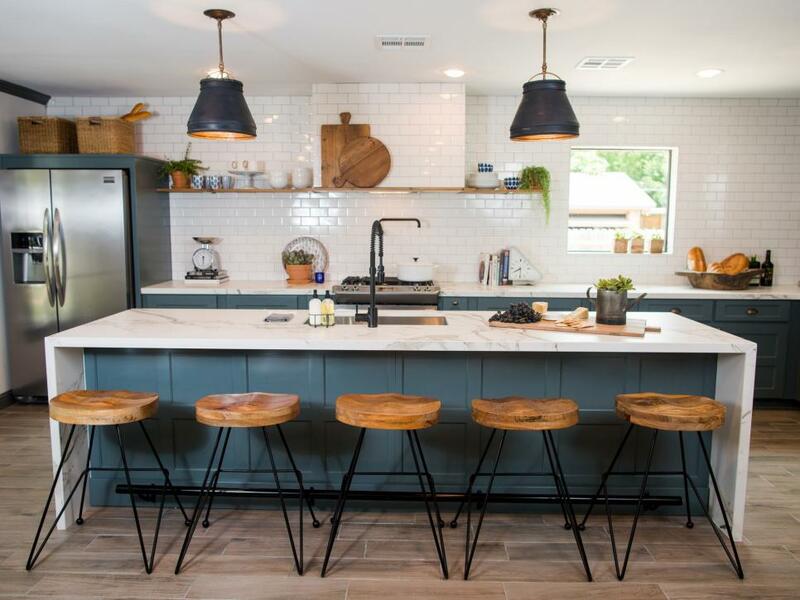 As seen on HGTV's Fixer Upper, to maximize the space in this kitchen, Joanna added a functional kitchen island to increase seating options and give the family more prep space for meals. 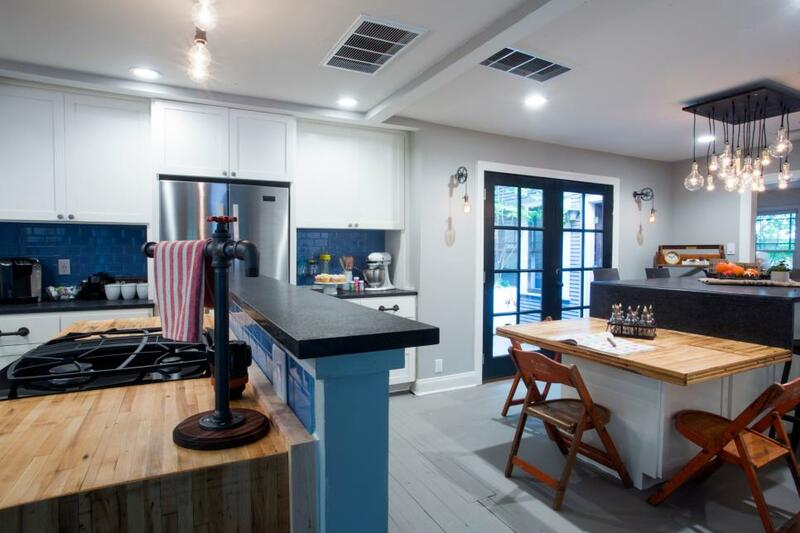 Gray cabinets match the gray trim and molding from the rest of the open concept first floor, and rustic stools provide complementary style. A subway tile backsplash polishes off the space, finishing out the design. 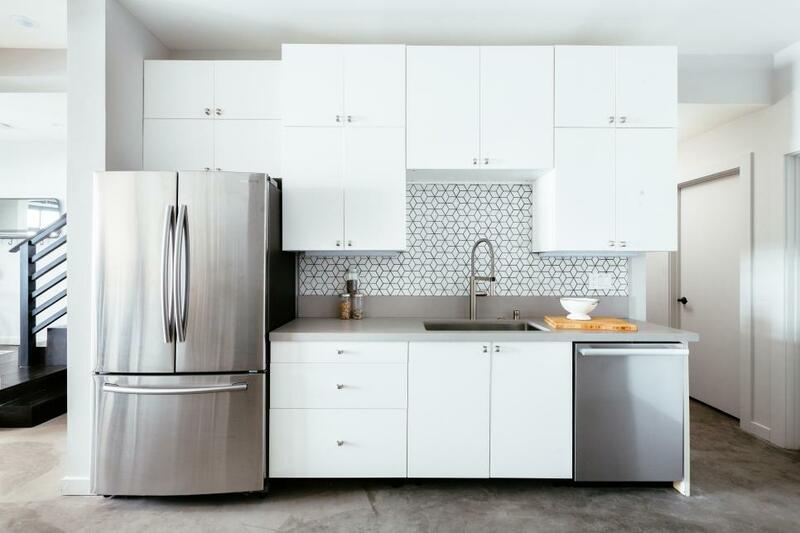 The third wall in the communal kitchen is chock full of cabinets with stylish, brushed nickel door knobs and drawer pulls to help keep everything organized, while the commercial sized appliances give the space room to accommodate its many occupants.